Seal coats serve to seal the top of the asphalt, preventing water from penetrating the surface of the pavement and protecting the top layer of asphalt from oxidation and wear caused by exposure to the sun, air and traffic. Seal coats also aesthetically enhance the pavement by providing a smooth, black, even surface ideal for striping and cleaning. Seal coats are designed for off highway use where there are low traffic speeds and tight turning radiuses such as residential streets, parking lots, mobile home parks, schools, shoulders, etc. Beautification – Fresh seal coat brings a dark black color to the pavement, making it look and wear like new. A black parking lot has a clean, rich look that presents a positive image of the company, facility or residential complex. Striping also enhances the beauty of a newly seal coated parking lot. Slows oxidation and water penetration – Exposure to oxygen hardens asphalt binders and results in a brittle pavement surface that soon cracks. These cracks permit water to penetrate into the sub-base, weakening it and reducing pavement strength. This in turn leads to more cracks which can eventually expand and become potholes. Seal coating fills surface voids, reducing exposure to oxygen and water and prolonging pavement life. Resists gas and oil spills – Gasoline or oil leaking from an engine can soften asphalt. Because coal tars aren’t soluble in gas or oil, coal tar sealers prevent this damage. And manufacturers of asphalt emulsion sealers usually add polymers to increase the resistance to gas or oil. By filling surface voids, sealing reduces the depth to which oil or gas can penetrate. Resists ultraviolet rays – Ultraviolet rays from the sun break the links between carbon bonds within asphalt. Seal coating does not repair any damage that has already occurred to the asphalt, but it does prevent ultraviolet rays from further damaging the asphalt pavement. Easier to clean and maintain – Seal coats fill surface voids while coating the pavement surface, The resulting smooth and even texture makes surfaces easier to maintain year-round — snow is easier to remove from a smooth surface and sweeping is more effective on a smooth surface. 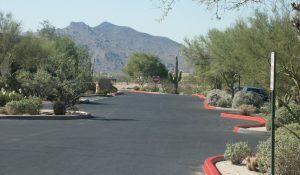 Increased pavement flexibility – A seal coat keeps a parking lot black. The blacker it is, the more heat it draws from the sun; the more heat it draws, the more pliable it is, the more able it is to withstand traffic volume changes without cracking. Cost-effective in the long run – The price of asphalt concrete will always be affected by crude oil prices which fluctuate when supplies vary. It’s less expensive to seal coat a parking lot every couple of years using a coal tar or asphalt emulsion than it is to overlay or place a new lot.